Style Option...? 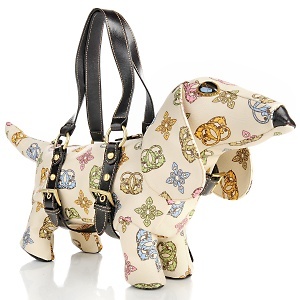 The Sharif Signature Kenya Collection Dog-Shaped Bag. So I get that fashion has no boundaries; however, what the heck? Is this handbag supposed to store the typical lipstick, mascara, wallet and cellular phone? Or is it meant to store an actual dog? I’m not criticizing the creation, I'm just trying to understand the intent. Hm. It's "not the same old of bag"—well that's for sure. But hey, if you desire to make a statement and stand out in a crowd...you'll certainly do it carrying this bag.